37,715 of 55,886 registered electors (67.49 %) -- does not include electors who registered on election day. 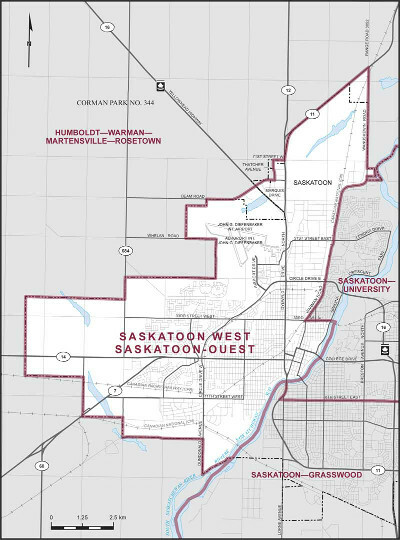 The Saskatoon West Electoral District Association was founded March 10th, 2014, and a new executive was established March 20th, 2014. We are an exciting Electoral District that combines about 25% of the former Saskatoon Wanuskewin and 75% of the former Saskatoon Rosetown Biggar. Consisting of those parts of the Province of Saskatchewan and the City of Saskatoon described as follows: commencing at the intersection of Highway No. 11 with Range Road 3052; thence southerly along Range Road 3052 and Wanuskewin Road to the easterly limit of the City of Saskatoon; thence generally southerly along said limit to Wanuskewin Road at approximate latitude 52°11'43"N and longitude 106°37'23"W; thence generally southerly along said road and Warman Road to 33rd Street East; thence easterly along said street and its production to the South Saskatchewan River; thence generally southwesterly along said river to the southerly limit of the City of Saskatoon; thence southwesterly, generally northwesterly and generally northeasterly along the southerly, westerly and northerly limits of said city to Beam Road; thence easterly and northeasterly along said road to Marquis Drive; thence easterly along said drive to Thatcher Avenue; thence northerly along said avenue to 71st Street West; thence easterly along said street to Highway No. 11 (the northwesterly limit of the City of Saskatoon); thence northerly and northeasterly along said highway and said limit to the point of commencement.